So you’ve taken care of your college tuition, but now you’re hit with a ton of other college expenses like housing, books, and fees. At face value, these can seem overwhelming. This article will break down these extra education expenses and different ways you can save on them. Many colleges provide a breakdown of costs that are typical for a student living on campus. Start by going over any fees you have to pay your university beyond tuition. Then, look into other expected costs. Keep in mind that this is not exact and there very well may be other costs you’ll have to incur. For example, textbooks are a substantial expense for many college students, and this additional cost may not be included in the breakdown. But, this resource will be a good starting place to understand your additional education expenses. Used books knock the price down because, well, they’re used. Many on-campus bookstores have this option for students as it’s an easy way to save on money while giving a student the exact same product–albeit maybe a few bent pages and pen marks. Plus, this system is more efficient overall as bookstores will simply resell books that students return, donate, or sell, instead of ordering new books. If you’re looking to buy a used book and your campus bookstore doesn’t sell the book you need, there are tons of external sources for buying or renting textbooks. Similar to used books, except typically even cheaper. You rent a book from the campus bookstore or an external source. Usually, these rental books will already have been used, but are in working condition. Then, at the end of the semester or quarter when you’ve completed the course, you simply return the book. Again, this is fairly common on and off campus, but you have to make sure you a) return the book on time, and b) keep the book in good shape. Set a reminder for yourself to return the book by either setting a calendar notification on your phone or marking the return date on a post-it note that you stick to the book. Then, check what the requirements (i.e. if highlighting the book is allowed, water damage policies, etc.) will be upon returning the book so you know what to expect and don’t lose the money you saved by renting because the bookstore or company won’t take the book back. Keep these requirements in mind when, say, sticking that leaky water bottle in your backpack with your textbooks. Ebooks will be much cheaper than hard copies of books. And, better yet, ebook rentals will be cheaper than already discounted hard copy rentals. If you’re comfortable with digital copies of your textbooks, this can save you both money and backpack space, as you’ll only have to carry around your laptop or tablet. Plenty of campus bookstores offer ebook options, or you can usually find the Kindle version of the book. “Certainly selling digital versions of books is more cost-effective for the students. And, frankly a lot of students who are coming in have grown up with this type of platform throughout their education so far. So students are seeking out digital materials instead of carrying around books,” said Cowan. Another option that some schools offer are different digital access programs. These are usually delivered through a college or university’s learning management system. Students are given access to the digital version of all the materials a professor requests for a class, but are given the option to opt-out. This drives the digital content price down even further, and again, makes things more convenient for streamlining student’s material. Cowan explained why these types of platforms are another good option. “I think it does partly have to do with students requesting it because it’s what they’re comfortable with but I think it’s also has to do with faculty looking to utilize really great comprehensive tools in their class as well. They can reach and communicate with their students a little bit better with these platforms,” said Cowan. Then of course, there’s Amazon and Chegg. Before buying something in the campus bookstore, check online for ebooks, rentals, and used books to make sure there isn’t a disparity in price. Your bookstore may even price match, and you can get the book for the lower price then and there. However, make sure that if you do get a book online that it comes from a reputable source. “Clearly the marketplace is a great place for students to do comparisons and maybe purchase some materials, we just always encourage students to kind of be aware of the fact that sometimes they may not get exactly what it is they need for the class or they may receive a counterfeit book; it’s not all the time but it does happen,” said Cowan. Overall, it’s just best to know what’s out there and what your options are, so make sure to shop around before dropping hundreds of dollars on a textbook. “There are times when Amazon’s just going to have a better price and that’s just the nature of it and ultimately we are here to make sure the students get what they need and get a price that they can afford,” said Cowan. This is one of the biggest costs to college students. For the 2018/2019 school year, college students attending public, four-year universities are spending an average of $11,140 on housing. Many schools offer different on-campus housing options, such as single, double, or triple-bed dorm rooms. But of course, you can also look off-campus to see if there are any cheaper options. The general rule of thumb is the more people you live with, the cheaper it will be. “Sometimes especially in major cities, even on-campus housing can be relatively expensive, so there are ways to go around that is trying to find your own housing situation and maybe getting a certain number of roommates in a house or sharing a room somewhere might be a little bit more affordable,” said Elaine Rubin, Senior Contributor and Communications Specialist for Edvisors. Another way to lower the cost is to live in a less expensive dorm hall. You can find this out by simply looking at the varying dorm prices, or by checking with your university to see if they offer any economy options. “These economy options may be a housing building “that isn’t as new as some of the other housing situations, it might have an extra shared room situation depending on how your college sets it up, but it’s a way to make it affordable,” said Rubin. A final option would be to get a position with student housing as a residence director or resident assistant. This will usually eliminate your housing cost or deeply discount the cost. Many schools bundle meal plans into your housing, but you may still have a few options. First, check to see if your college offers different meal plan options. For example, there may be an unlimited option–the most expensive–and a few lower price point options that give you a set number of meals. If you know you will use the unlimited plan, this might be worth it. But many students find that they don’t use all of what they pay for with an unlimited meal plan option. You can go with a lower price option, which may be enough, or you can combine a low point option with a bit of cheap dorm cooking. Click here for some cheap, easy recipes you can make in your dorm room. Often, colleges and universities require additional fees beyond tuition, and they’re getting to be quite significant. Since 2000, fees have risen by 95 percent at public four-year universities. These fees fund things like student activities, technology, library costs, athletics, etc. These fees can really add up, and there aren’t many ways around them, so make sure you pay attention to this when evaluating your college costs. However, Rubin advised checking with your school to see if there is any flexibility as far as out-of-state tuition and fees. 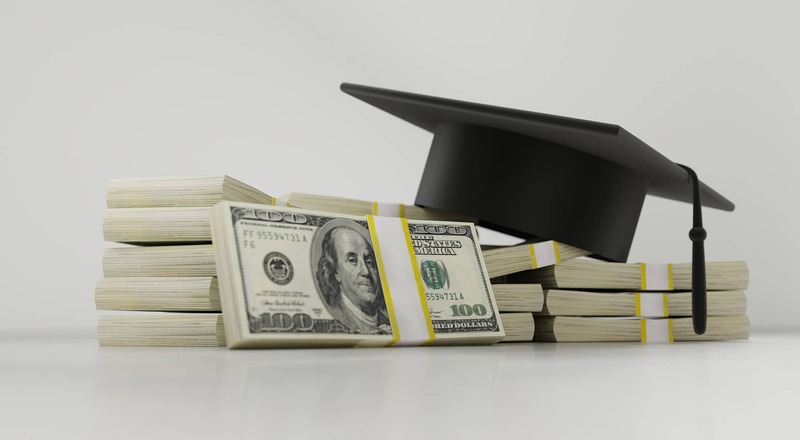 “A student that is going to a state school but they’re out-of-state or not a state resident, it might be worth it to talk to the financial aid department to see, especially if they don’t qualify as a resident yet but they’re working towards it, to see if they can get an in-state tuition type of charge instead of doing the full out-of-state tuition. See if there’s any flexibility with that because it won’t necessarily eliminate fees but it might reduce the cost of fees in general,” said Rubin. Depending on other factors like transportation, lab courses, and fines, there may be a few other costs. Make sure you’re aware of these so you can adjust plans if needed. For example, you may decide it’s too expensive to bring your car. Go over these additional factors so you can plan financially. Transportation: If bringing a car to college, keep in mind that you will have to pay for parking, which can get very pricey, and you may have to register your vehicle with the school. Depending on what you’re planning on using transportation for, a bike will be much less of a headache. While you may have to register your bike on campus, this will be a much lower cost. For those times when you do need a car, rideshares like Uber and Lyft, or carshares like ZipCar will be much cheaper than keeping a car on campus if you are only needing a car every once in awhile. Lab fees: If you’re in a major that requires lab courses, many of these will also require lab fees. Unfortunately, there isn’t much you can do about this, just know that they exist and be prepared for them. The one exception is if you are on financial aid, as sometimes you can have fees like this waived. So if this is the situation you’re in, check with your university’s financial aid office to see if you can be excused from lab fees. Healthcare: Almost all colleges and universities offer some sort of healthcare, and this can be fairly inexpensive if you otherwise don’t have health insurance. However, if your family is under a family plan, this could make more sense for you. Look into your current and college option to see which is best for you and your healthcare needs. Fines: These can add up if you aren’t paying attention! Make sure to stay on top of library returns, legal parking, and housing responsibilities–such as keeping your room key in a safe place. The bottom line? College costs more than what you pay in tuition. Keep these factors in mind when evaluating what schools you can afford, and what is and isn’t worth the extra money. Then, look for ways to save on flexible factors like books and housing to help make your degree a bit more affordable.